It is becoming increasingly important to provide evidence of the impact of your youth work practice. Knowing what effect your work has had on young people, volunteers and the community is invaluable. It allows you to report to external agencies such as funders and also to assess where you have gone right and which areas of your work could be improved. 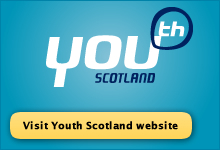 Here you will find a series of Youth Scotland resources to help you eveluate and evidence your work with young people. A series of practical mini toolkits, created in partnership with Evaluation Support Scotland, on the themes of: Setting Outcomes, Measuring Outcomes, Analysing Outcomes, Reporting on Outcomes. A pratical quality improvement toolkit for voluntary and community youth groups in Scotland - which focuses on the needs and outcomes of young peole and the actions a youth group can take to develop, support and improve these outcomes. A toolkit which explores creative ways to engage young people in consultations and evaluations. This toolkit is curently available through attending a training workshop. A mini-evaluation toolkit to support youth groups and organisations to report on grant funding. A useful summary of the purpose of youth work, how youth work fits into the wider world of Community Learning Development (CLD) and signposting info to CLD policy, learning opportunities and support agencies.